It’s the stuff of nightmares: Fearing that the walls of your home are crawling with snakes, only to find out that no, this isn’t a bad dream, there are actually reptiles infesting the house you live in. That was the reality for one Maryland family who’s now suing their home’s previous owner and the real estate agent behind the sale, claiming both parties knew the house was chock-full of snakes before they sold it. At first, when the family’s four-year-old son saw a three-foot black snake hanging from the facade of their new home in Annapolis, his parents thought it was a good thing, reports the Washington Post. They’d spotted a snake’s shedded skin in the house months ago and thought this meant they could get rid of the home’s snake problem. But a week later, they found a seven-foot black rat snake. Then they found another, and another and so on until it was clear that there was a definite snake problem that wasn’t going away. They called in a contractor and a snake inspector who gutted the basement and told them the house was snake-infested and as such, not suitable for children. The family moved into a relatives home after living in their new house for only four months. 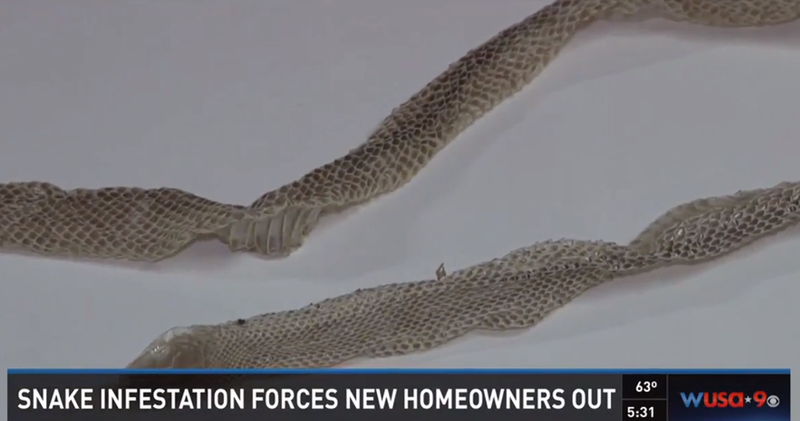 They’re now suing the previous owner of the house and her daughter, the real estate agent who sold the home to them last year, claiming they knew the house was infested with snakes and hid it from the family in order to make the sale. When they heard rumors from neighbors about a possible snake issue, they approached the real estate agent who allegedly “assured” the family that the prior rental tenants were people who didn’t want to pay rent and had mocked up a picture of a snake at the property to get out of the lease. The agent allegedly had a pest-control company do a “snake away” treatment, and during inspections the family didn’t see any snake activity. That was just part of an act, the suit alleges. But after finding snake upon snake, it seemed the infestation was all too real. The lawsuit is seeking a combined $2 million in damages, claiming the snake infestation was so bad that an inspector spotted snake “highways” in the basement walls that the serpents used to slither around the home in. Though black rat snakes aren’t venomous, the family says they’ve had severe respiratory problems due to living with an “excessive amount of snake feces.” The distinct smell those snakes leave behind means the family can’t move back, the mom says, as the smell can bring more snakes slithering. The real estate agency’s lawyer declined to comment to the Washington Post, due to the ongoing litigation.